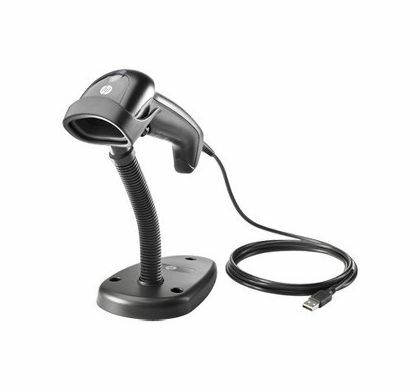 Deliver an efficient customer experience with the handheld HP Linear Barcode Scanner II, which reads common 1D barcodes, including barcodes from mobile devices, and keeps your associates comfortable with an ergonomic design that can be used by hand or set it in the stand for presentation mode. Quickly scan common 1D barcodes, GS1 DataBar linear codes, and barcodes on mobile devices with a long depth of field (DOF) and wide field of view (FOV) that reads longer 1D barcodes at a closer distance. Intuitive feedback confirms a successful read. Help ensure accurate scans from mobile devices and on conveyor belts during checkout with enhanced motion-tolerance technology. 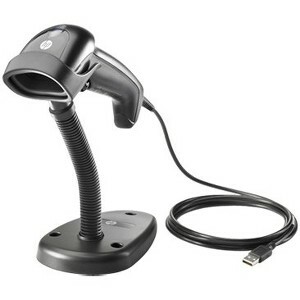 Use by hand with the redesigned ergonomic grip, or set it in the stand for fixed-location scanning. Plug the attached USB cable into your retail system. The extended 6.5 foot length gives you room to maneuver to hard-to-reach barcodes. Rest easy that your IT investment is supported by a three-year standard limited warranty.